Hope…a four-letter word that can be so difficult to have and keep, especially when going through a tough situation in your life or relationship. I clearly remember sitting in the small townhouse I lived in Mississippi. I was a 27-year-old PhD, well respected in my field as a relationship expert and yet found myself crying my eyes out after discovering that my then boyfriend had lied to me. He had very likely been cheating on me, and judging by what I had just found online, he was not nearly the “Prince Charming” that I had hoped. That day, as tears ran down my face, I silently vowed that I was done with dating. I was sick of being disappointed. I was absolutely heartbroken. I felt as though I had been played a fool and no hope could be found. Those first few days and weeks were long and the tears were many. Over time, days once filled with misery slowly became bright again and my broken heart healed. Soon, I embarked on the dating journey that I had sworn off. The fear was still real but I had found it’s greatest adversary. I had found hope. What is hope? So what is hope, anyway, and what does it mean for a relationship? Good Ole’ Webster defines it as a feeling of expectation and desire for a certain thing to happen. 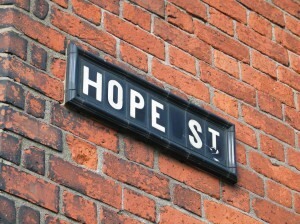 Hope is about relief, restoration, and the chance to look forward and believe something better is beyond the bend. Why have hope? In the Bible, the word hope appears well over 100 times. If it’s in the Bible that many times, it’s important. I think all of us need hope for our relationships–whether present or future ones. Let’s face it, relationships are hard work. Everyone has problems, disagreements, and even moments of crisis. There is substantial research that demonstrates how important hope is for relationships–both in and outside the therapy room. When you have hope, you believe in yourself and/or your relationship more. It pushes you to keep moving forward and keep working toward your goals of improving the relationship you are in. Is hope enough? Hope is in your head and in your heart. But that’s not enough. Actions are required. Take some time to reflect on and share your hopes–whether in your journal or to your mate. Share the hopes that you have for yourself, your life, and your relationship. And after you’ve figured those out, start doing something about it. Get a babysitter. Go on dates. Play a board game. Create a dream board. Speak and begin to believe the reality of your hopes and dreams. When you do, I’m convinced it will energize your life and your relationships–giving you something to work towards. In life, adversity is a reality that cannot be escaped but, I know from experience hope put into action is a hero that cannot be overcome.